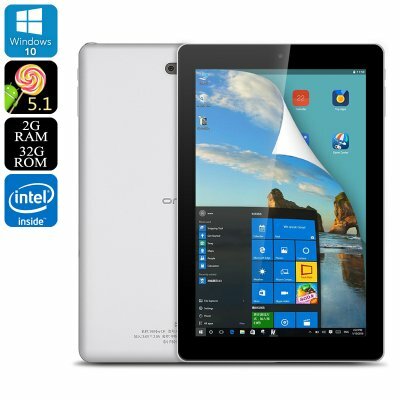 Successfully Added Onda V981w CH Tablet PC - Dual-OS, Windows 10, Android 5.1, OTG, Quad-Core CPU, 2GB RAM, 8.9-Inch Display, 5800mAh to your Shopping Cart. Enjoy a magnificent mobile entertainment experience with the Onda V981w CH dual-operating system tablet. Featuring both Windows 10 and the Android 5.1 OS, this little beauty is the perfect tablet PC for everybody out there that likes to enjoy the best features offered by Windows and Android within the same device. Its powerful hardware, latest software and Dual-OS makes this tablet computer the perfect tech gadget to be used for business, entertainment, and study alike. No matter your demands, the Onda V981w CH is a tablet that is sure to meet your liking. With its beautiful 8.9-Inch IPS display, this tablet PC delivers stunning graphics, high detail, and vivid color in a 1920x1200 Full-HD resolution. From now on you’ll be able to enjoy the latest movies, 3D games, and applications in breathtaking quality – truly enhancing your mobile media experience. Packing an 8th generation Intel HD Graphic’s unit, this Dual-OS tablet computer is capable of running the most graphically demanding media out there in mesmerizing beauty, allowing you to enjoy a truly cinematic experience every time you turn on your tablet PC. Added that the Onda V891w CH furthermore supports OTG through which it lets you attach external hardware devices such as a hard drive or game controller to your tablet PC – further increasing your overall tablet experience. Packing the Intel Atom Cherry Train Z8300 CPU, the Onda V891w CH is a tablet PC that is capable of handling the heaviest of programs and latest applications without dropping a frame. Built for delivering a speedy and energy-efficient performance, this Quad-Core CPU that has been clocked at 1.44GHz is guaranteed to provide you with a smooth and powerful user experience. Added to that, this Dual-OS tablet computer packs 2GB of RAM, opening up the doors for excessive multitasking sessions without you needing to worry about slowing down your device. With 32GB of internal memory and the possibility to attach 128GB of external storage, the Onda V891w CH tablet always holds enough space for you to save your favorite media, games, and files alike. Featuring a powerful 5800mAh battery, this tablet computer packs enough juice to get you through the most demanding of days without needing to worry about battery life. Thanks to its lightweight and portable design, the Onda V891w CH can be efficiently carried around wherever you go. Simply slide it into your bag and bring it along at your next business meeting or use it to stay entertained in the back of the car during an upcoming road trip – this Dual-OS tablet computer is a truly multifunctional device that is sure to meet your demands and provide you with an exceptionally great user experience. The Onda V981w CH Dual-Operating System tablet comes with a 12 months warranty, brought to you by the leader in electronic devices as well as wholesale electronic gadgets..
Arabic: - نظام التشغيل المزدوج الكمبيوتر اللوحي - Chinese Simplified: - 双操作系统平板电脑 - Czech: - Duální operační systém počítače Tablet PC - Dutch: - Dual besturingssysteem Tablet PC - French: - Double système d’exploitation tablette PC - German: - Dual-Betriebssystem Tablet-PC - Hebrew: - כפול מערכת ההפעלה Tablet PC - Hindi: - दोहरी ऑपरेटिंग सिस्टम टैब्लेट PC - Hungarian: - Kettős operációs rendszer tabletta PC - Italian: - Doppio sistema operativo Tablet PC - Japanese: - デュアル オペレーティング システム タブレット PC - Korean: - 듀얼 운영 체제 태블릿 PC - Malay: - Dwi sistem operasi Tablet PC - Norwegian Bokmål: - Dobbel operativsystemet Tablet PC - Romanian: - Sistem de operare dual Tablet PC - Russian: - Двойной операционной системы планшетного ПК - Spanish: - Doble sistema operativo Tablet PC - Thai: - ระบบปฏิบัติการสองแท็บเล็ตพีซี - Turkish: - Çift işletim sistemi Tablet PC - Vietnamese: - Hai hệ điều hành máy tính bảng.